The Harry Potter films are wonderful - yes, yes, they are. While the series has its share of haters, I am certainly not one of them, and creating eight films of this caliber and quality over the course of of a decade is a unique feat unlikely to be matched again. Sixth scale collectors have never gotten a great series of figures, which is pretty shocking considering the breadth of characters and popularity of the license. That is, they didn't until Star Ace picked it up and released their Harry about 18 months ago. Since then, they've released a fairly steady stream of main characters, including Harry, Ron, Hermione, Voldemort, Snape, Moody, and Sirius Black, with a few variants thrown in for good measure. They have two new characters hitting very close to each other - Hagrid, who I'm covering tonight, and Dumbledore, who I should be reviewing in the next couple weeks. They also have Malfoy coming soon, along with additional versions of Harry and Hermione, and I expect we'll see some big announcements during SDCC next month as well. 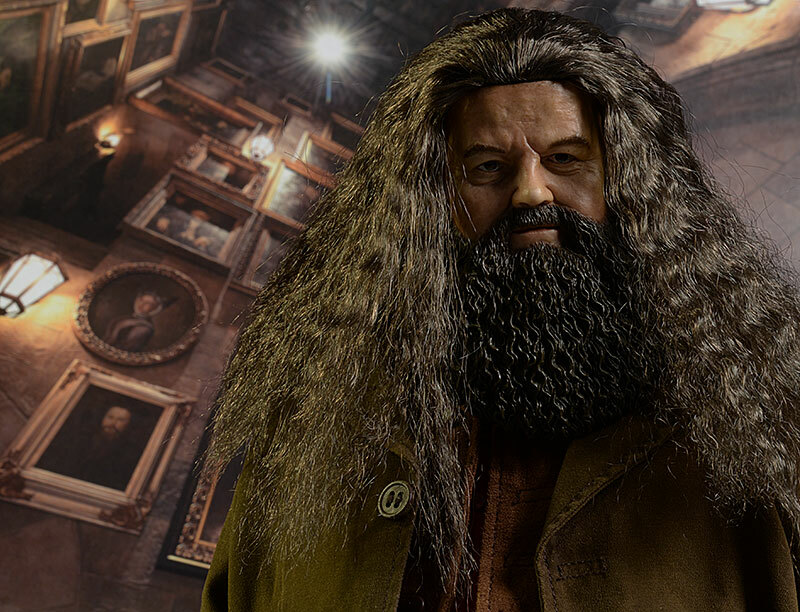 Hagrid comes in two versions: a regular and a deluxe edition. You can find the regular for around $340 at most places, while the deluxe (with additional accessories) will cost you closer to $380. However, check my Where to Buy section to find a sponsor with a fantastic deal on the deluxe. And don't give me any crap about the purple background. I liked it, and you'll probably see it in another Harry Potter review soon. This package was designed by the tremendously talented and fantastically handsome Eamon O'Donoghue (I'm only half lying), who is doing quite a bit of work with Star Ace right now. 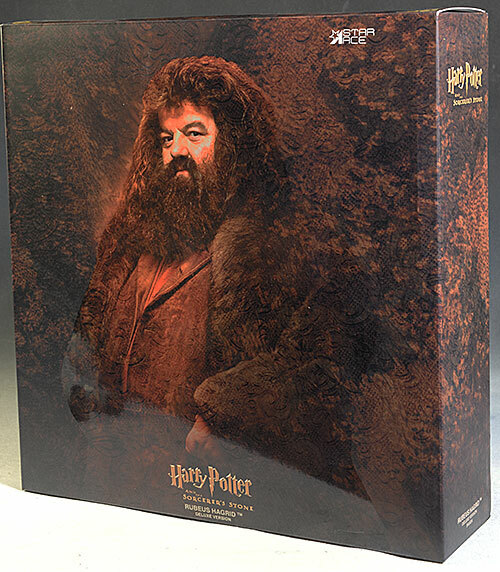 The character photo of Hagrid is glossy, while the rest of the package has a matte finish, allowing the character to pop on the cover. Inside is a single tray that holds the various accessories, in mostly a collector friendly way. There are two twisty ties holding in the cross bow - a big no-no in my book - which cost them a half star. Star Ace went with a rooted hair/sculpted beard combo, which we also saw with the Saruman from Asmus. This is likely to be a common answer to men with huge beards (expect the same with Dumbledore from Star Ace and Gandalf from Asmus, both coming very soon), and it works better with some, not so much with others. Early prototypes went with a rooted beard as well, and that was a follicle nightmare. I prefer this choice, just like I did with Saruman, and I have hopes that the next two figures that use this technique (Dumbledore, Gandalf) will also turn out well. There are some issues with the rooted hair, but let's talk about the portrait first. I used a number of images for comparison, including this calm expression, this happy expression, and this stock photo. Out of the various images, this one makes for a great side by side with my photo of the figure just below. Using that as my main source of comparison, I found that the eyes and general face shape were good, with about the right wrinkling and age. Even the thin lips are accurate, a unique feature of the character. 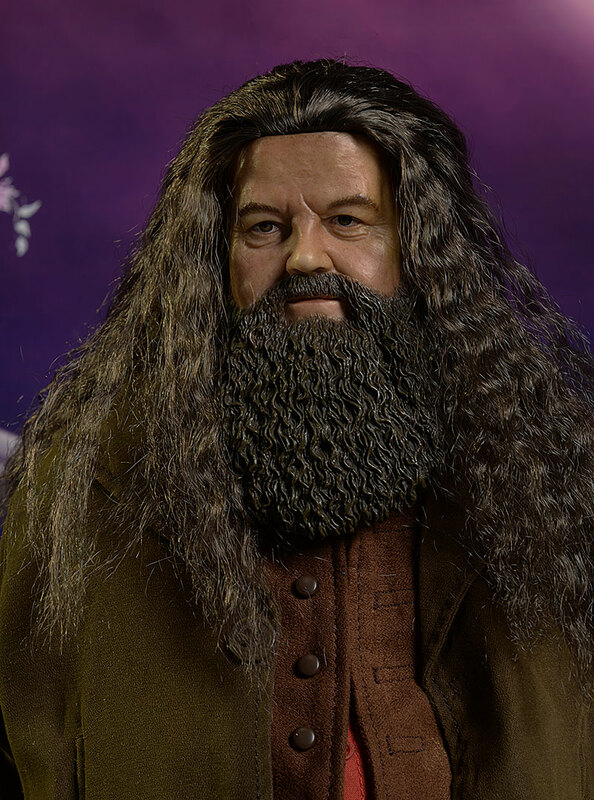 My major issue comes in with the nose - Mr. Coltrane sports a large, round, bulb-like nose, while this Hagrid ended up with 'average white guy' nose. This small nose throws off the rest of the face quite a bit. When it comes to my other two key areas - realism and life-like - this sculpt is much better. As I said, I like the combination of rooted hair and sculpted beard, and the finely sculpted hair of the beard matches the slight wave of the rooted hair quite well. The skin texture and wrinkling give the face a very realistic appearance, and the chosen expression works well. The expression isn't wax museum, but it isn't overly dramatic or dynamic either, which is quite appropriate to the character. Now back to the rooted hair and beard. There's a lot of hair here, at least in terms of length and volume down the sides. That's a good thing, since like young Hermione, Hagrid had a lot. The hair also has a very well defined hairline at the top of the forehead, something that really bothered me out of the box. You can't fix it - at least not completely - since the hair plugs run ear to ear on his head, and are designed with long hair to be combed backward from the forehead to cover the top of the head and hang down the sides. There's nothing short up front that you can really pull loose and have hang over the face, similar to the look on the front of the box. However, as I perused a lot of different photos of the character, I realized he did look this way on occasion. Here's a good example, and another. You can also work at the sides of the hair to bring it inward toward the face, and loosen it up a bit around the temples, and get a much better look than what he has in the box. That's not to say that I ended up loving the hair entirely. 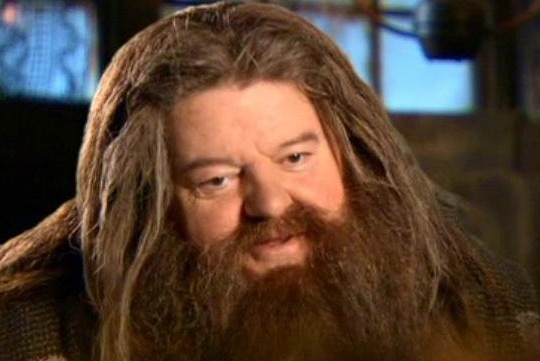 I think it's a little too long on the sides, and you can see what I mean with the photo of Hagrid walking. Here, I tucked up the ends of the hair on the sides to shorten it, and I think it looks better than when the hair is laying out full on his shoulders and chest. I suspect we'll see some gusty customizers trim this mane up quite nicely, but that won't be me. Another area that futzers will notice is that while there is seemingly a lot of hair, there isn't a lot of plugs. There's only a few plugs in a couple rows, and when you start messing around with the hair style you're going to notice it. However, I don't think this is a matter of quality or going 'cheap'. One of the tricks to getting the rooted hair to look right is to keep it thin and fine, to avoid too much poofiness. Too many plugs on top creates a higher crown, and a less realistic look. Every time I rearranged the hair, I'd uncover the head. But covering it again completely was never an issue, and the volume all around is more than sufficient. My only real gripe is that there wasn't anything I could do to create the bangs or flips in front, and that limited some of the accuracy. When I first pulled him out of the box, I thought the stark hairline was going to be my biggest nit to pick, but it turns out that with some effort I could get it to a point that was acceptable. Instead, the tiny nose is what ended up being his greatest fault. 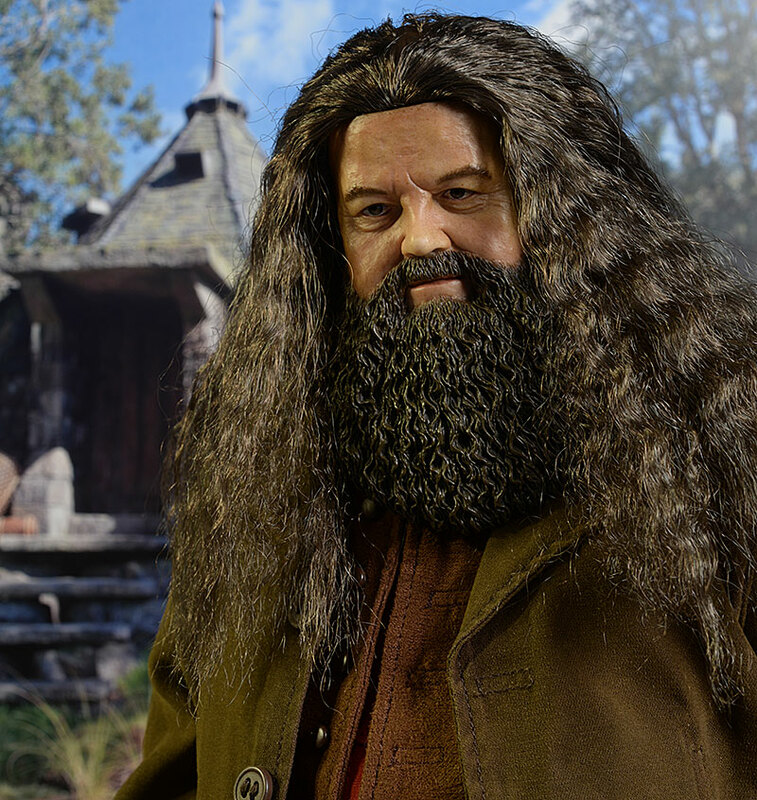 Star Ace designed a whole new body for Hagrid, and it's a big one. 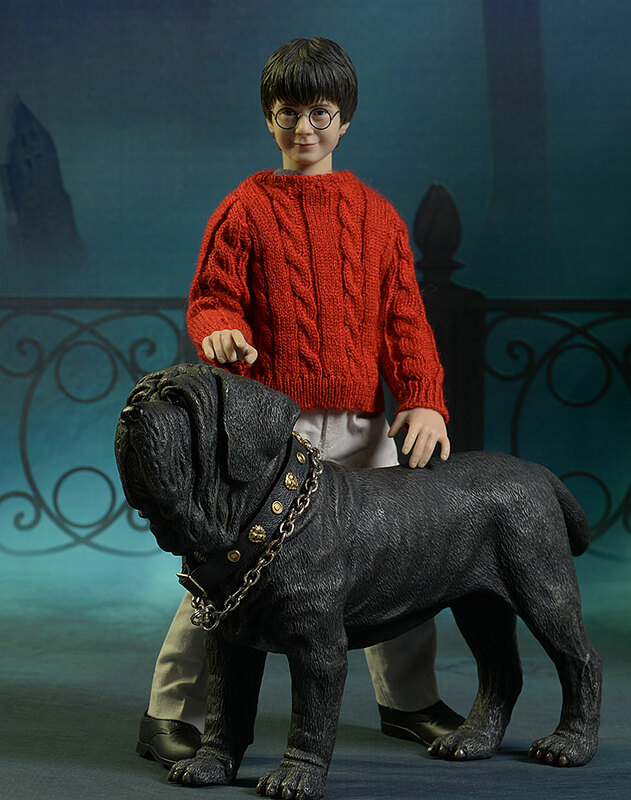 He stands about 16" tall, and will tower over the rest of the sixth scale Potter line. 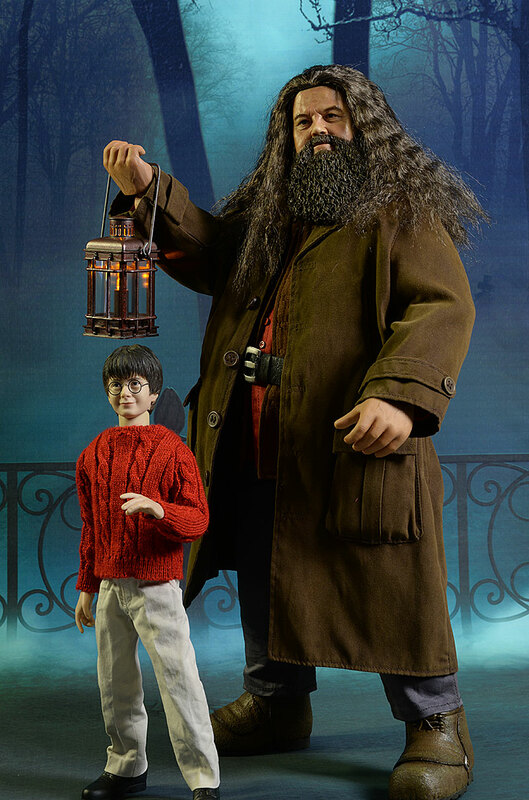 I included a shot of him with first year Harry, and I don't think there's any issue with Hagrid being undersized. The sculpted hands work well with the accessories, and the big boots have a terrific sculpt, detailing, and texture as well. There are two keys go getting the sculpted hair and rooted beard to look acceptable - the sculpt has to create a very detailed stranding in the beard with a style that matches the hair (check), and the paint has to match in color and tone (check). This matching color was particularly important here, with a character that has no gray or yellowing yet on his head. The brown on brown combo was extremely important to get right, and I think they've done an excellent job. It's also not just the color, but the finish, since the two materials can absorb and reflect light in very different ways. In the photo below you'll notice that both the beard and hair have the same sort of reflective quality on the highlights, with darker shadows below. I'm hoping that Asmus can pull this off with Gandalf, since the mismatch in color was probably my biggest issue with the early prototype photos. The rest of the paint work is the usual Star Ace quality. 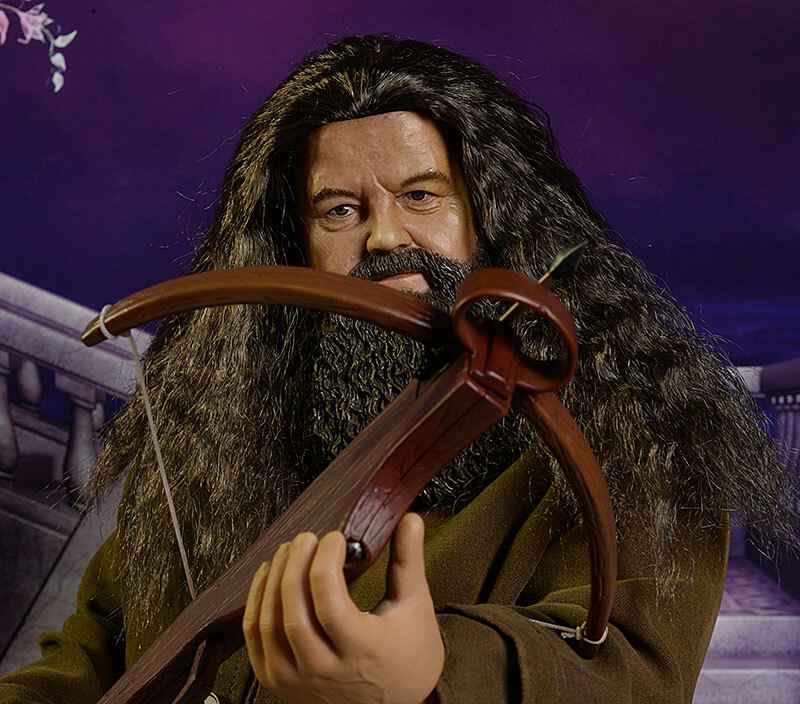 The skin tone is darker, but not so much a tan as a dirty look that seems right for Hagrid. The eyebrows and eyes are super clean, and there's just the right amount of reflection from the pupils to create natural catch lights and a wet appearance. 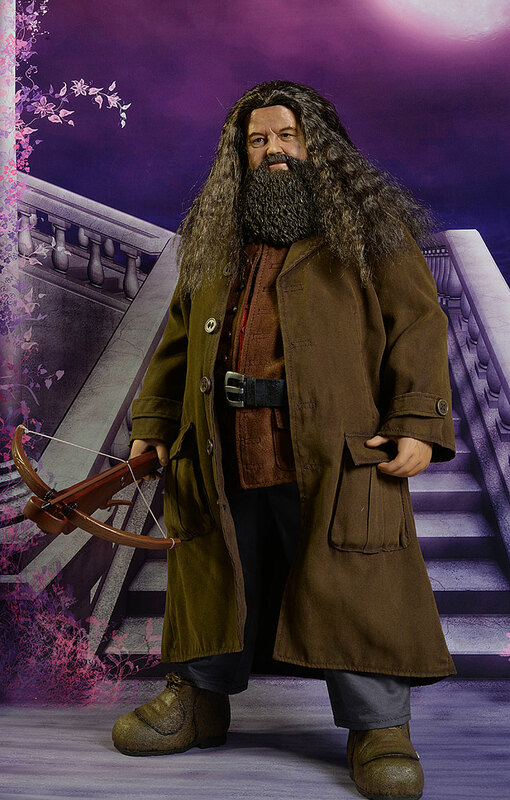 One of the reasons Hagrid is so expensive is the all new body underneath those layers of costume. As I mentioned earlier, he's quite tall, standing 16". But they didn't merely make an athletic torso and than pad it up a bit - the body itself is sculpted with the wider belly and thicker limbs. This makes for a much better looking figure - the clothes hang nicely - but it meant they had to redesign another joint system. The ball neck works quite well, even with the large beard. The beard itself is made from a fairly soft material, and is pliable enough to allow for tilt and lean action. I didn't strip him all the way down, so I'm going off feel and mobility for the rest of the joints. The shoulders appear to be rotating hinge, but above the chest movement is pretty limited. The elbows are pin joints, while the hands are very mobile ball joints. They have a long post that fits into the hand (and the hands swap easily), giving the appendage a ton of movement. There is no waist/torso joint, which is more of a problem than it might seem at first. I assume the newly sculpted torso prohibited any articulation, but the lack of a torso joint makes the leg articulation a little less useful. The hips are rotating hinge too, and the knees are pin joints. The ankles work great, and are probably ball joints similar to the wrists. Both of these lower joints have a better range of movement than I expected, even with the large boots. While the knees and ankles worked better than expected, the elbows were worse. There doesn't seem to be any cut joint in the bicep, and the elbow can't rotate, so bringing the hands closer together across the body is a problem. That means it's difficult to get a good two handed pose with the included crossbow. Hagrid won't take any crazy ninja poses, but that's not his style anyway. You can get him into some very natural, fluid, flowing stances though, which is the top priority with a character like this. Some sort of torso articulation would have been great, but with the newly designed body I can cut them a little slack. I'm looking at the deluxe version, which includes additional accessories at a higher price point. Let's start with what is included with both figures. Rubeus has his wand, disguised neatly as an umbrella. The umbrella doesn't actually open, but the top is actual cloth, wrapped around the long wand. He comes with three extra right hands, designed to hold various accessories including said umbrella wand. These swap easily, and thanks to the very thick posts at the wrist, there's no chance of breakage. I am bummed that there's no additional left hands, however. The left he comes wearing is sculpted in an open grip, which doesn't work all that well with every pose. Another left or two would have been quite helpful. None of the hands work great with the owl cage, either. More on the cage in a minute, but the fingers are too thick with any of the gripping hands to fit around the handle without risk of damaging it. The regular release also comes with his large crossbow and one bolt/arrow. The bolt doesn't stay on the bow particularly well, but I used a little poster tack and that worked great. The sculpt and paint job are basic, but that seems about right, based on my foggy memory of the screen appearance. Both releases also come with what I think is the best accessory of the bunch - the lantern with light up function. I'll discuss the light feature more in the next section, but the sculpt and construction on the lantern itself are excellent. Unlike the cage, he has no trouble carrying the lamp. On a side note, the marketing info said the lantern takes a CR2032, which is not included. They got the 'not included' part right, but on the inside of the battery compartment it says it takes a CR2016, which is what I bought and used. The marketing materials also said a display stand is included, but I sure didn't get one. I'm not too surprised, since his size makes using a stand difficult, but it's worth noting. The deluxe version adds three more extras. 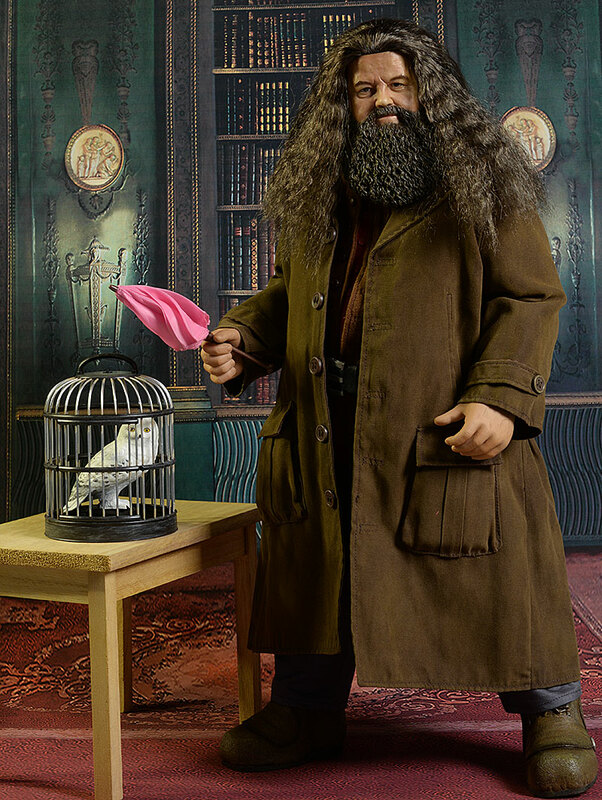 Hagrid comes with Harry's owl, a re-use from the Harry figure, as well as a cage for Hedwig. These are actually more useful with Harry than they are with Hagrid, particularly if you're creating a room diorama for a young Mr. Potter. The cage has a working door, and that's how Hedwig gets in and out. His final accessory, and the one most likely to convince people to buy the deluxe version is Fang. Harry had to get Hedwig, Ron had to have Scabbers, and Hermione will eventually get Crookshanks. 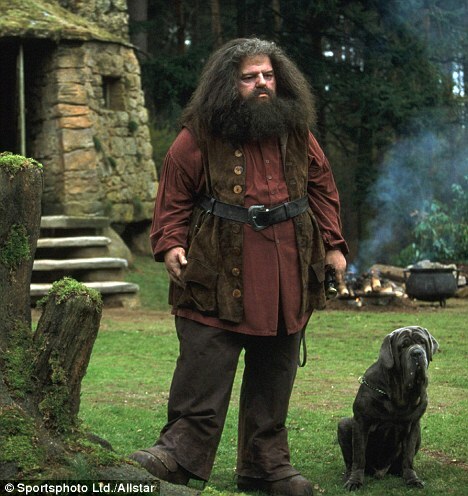 It only makes sense that Hagrid needs Fang, his loyal pooch. 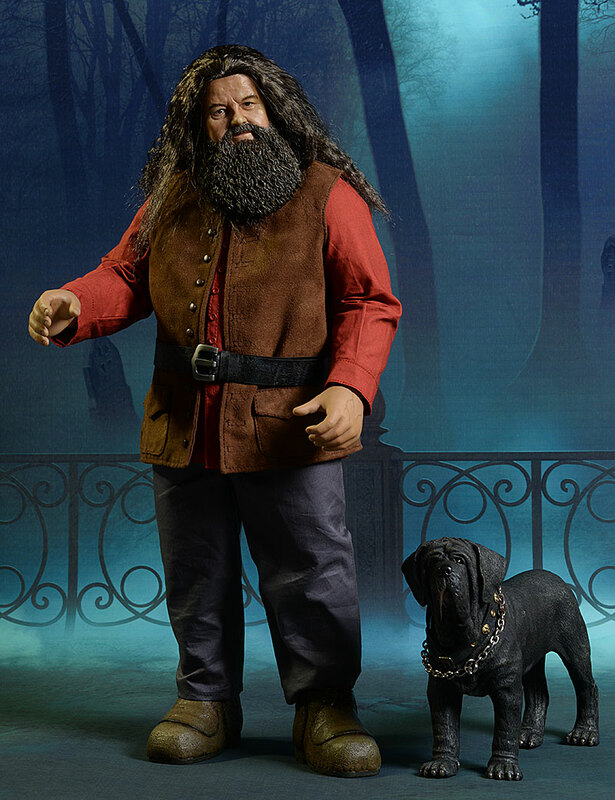 The marketing photos makes Fang look huge, standing with his head at Hagrid's waist. That is too large actually, because while we might have this vision of a monster dog in our heads, the reality is that he was big next to the kids, but not really that big next to Hagrid. But this version of Fang seems so...puny. When I pulled him out of the box, I was pretty shocked. I've included a photo of Fang with Harry, and one with Hagrid and Fang together. I was ready to really slam the figure for this itty bitty Fang, but I thought it might be useful to review some screen shots first. I'm glad I did. Here's a photo of Ron's face next to Fang - you can see that it's actually about right, when you compare it to the shot I have of Harry and Fang. Here's another one of Fang laying on the floor of Hagrid's hut, with an older Harry nearby. While he's a big dog, he's not a giant dog. This photo is a bit small, but it's a great shot of Fang standing next to Hagrid. He's clearly standing on higher ground, and it looks like his head is thigh high at best. And here's the best shot, with Fang sitting down (which makes him taller), and again, his head is thigh high at best next to Hagrid. I still think he's a smidge too small, and the thick front legs are making him look even shorter than he is. But he's not the glaring mistake I assumed, and the marketing photos actually have him sized much, much too large. By the way, the chain around his neck is real metal, not plastic. 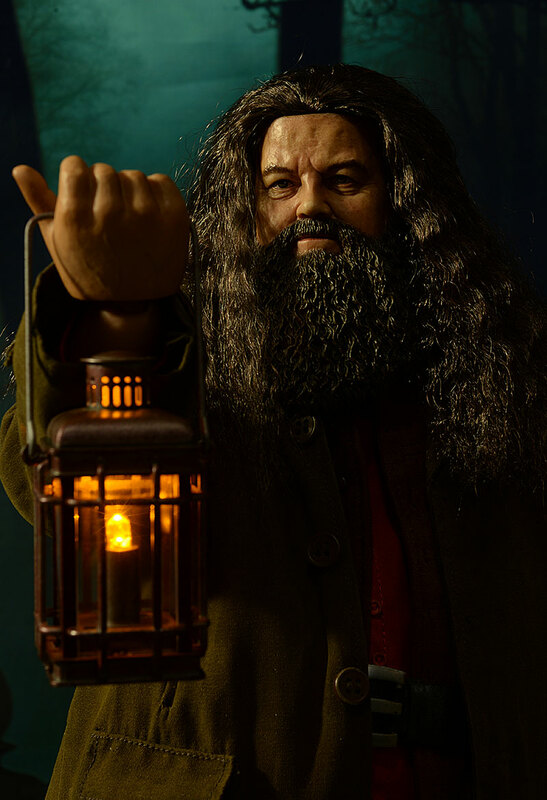 Hagrid carried a lantern quite often in the films, so adding one made complete sense. Adding in an actual light feature was icing on the cake. It's a pretty simple concept - use a light bulb as the 'flame' in the lantern. It looks great, and casts an appropriately yellow light. It's fairly bright, and the switch and battery compartment are on the bottom in an easy to reach spot. The single watch battery is not included, but they went with a very common, easy size to find. The outfit consists of multiple layers, all produced in very thin, high quality material. He has his long sleeved shirt and pants, with his brown vest, black belt, and long coat over top. Inside the boots are black socks, a feature I wasn't expecting. All the tailoring is excellent, and the stitching and construction top notch. The small details, like the buttons and pockets, look great, The pockets are usable of course, and the front set on the jacket come with foam inside to give them a full look. Like Moody, I expect some people will complain that the outfit needs more weathering. That's true to some degree, but this costume actually feels worn and used. It doesn't look tattered or dirty, but it has that soft, pliable feel of clothing worn and washed many times. It also allows the clothing to hang better, and while it might not be obvious in photos, you can tell when handling him. I would have liked a little more wear on the jacket and vest myself, but it's a pretty minor nit with an otherwise excellent costume. 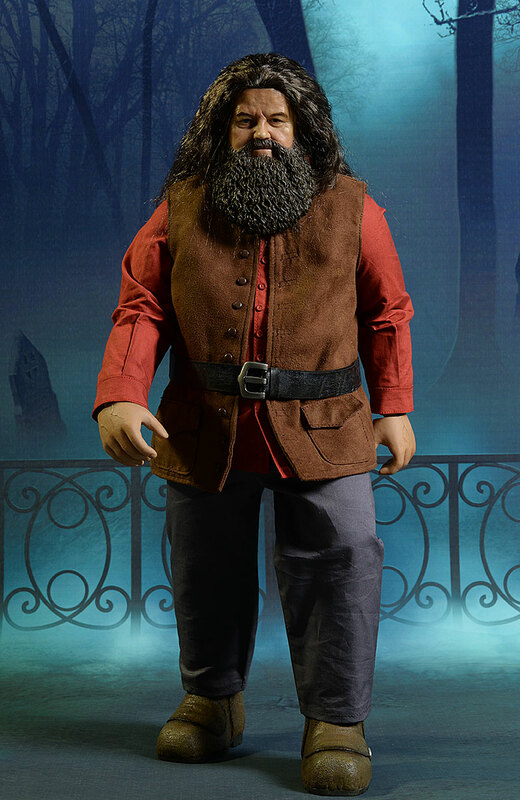 While he might not be the most articulated, you can still get plenty of different poses out of Hagrid. The rooted hair also allows for additional futzing, and you'll have a lot of fun - not frustration - getting just the look you love. The regular release will run you around $340, while the deluxe is $380. You can actually find the deluxe for $350 at places however (see below), making it a no brainer choice over the regular edition. I'm not sure I'd pay an extra $50 for Fang and Hedwig's cage, but $10? Hell yes. I think a good comparison for this guy is the Hot Toys Hulk, who cost $300 when he was released three years ago. Obviously, Hulk had another 1 1/2" or so on Hagrid and the PERS eyes, but he had almost no accessories and a very basic costume. 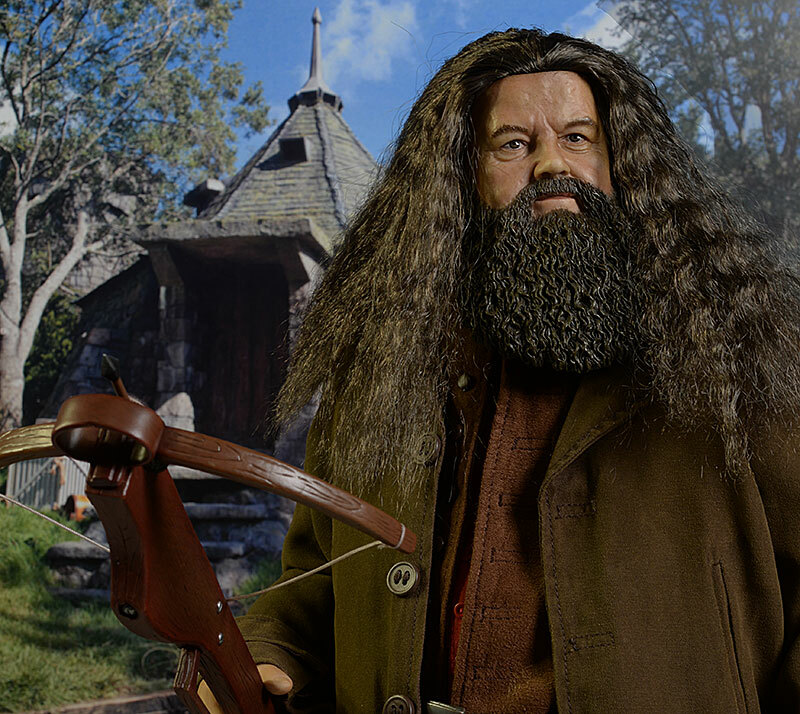 Hagrid not only has a great costume, but a pretty good assortment of extras, even when you get just the basic release. He also has a light up feature, and it's one that has actual value and is easy to use on the shelf. While he's still about 15% too expensive, he's just shy of an average value. Not a thing. The accessories are sturdy, and the hands swap easily. 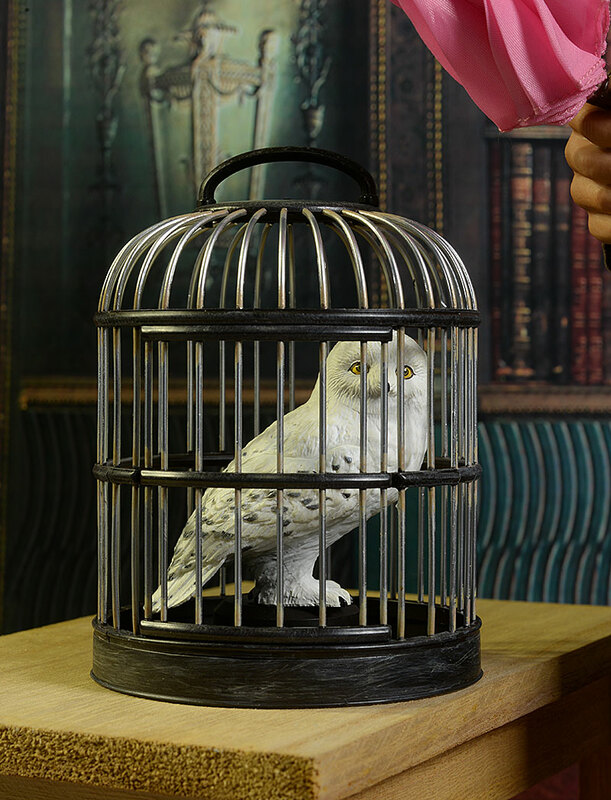 Don't try to force the handle of the owl cage into his hands however, since it's not a great fit. This is an interesting figure, because I think it will drive a lot of extreme views. If you're a huge Harry Potter fan, I'm betting you eat him up. And people who are totally against mixing rooted hair with sculpted beards will hate him before they ever see him. As it is with most things, the truth lies someplace in between. When I first pulled him out of the box, his hair was pulled back from his face, and the hair line was extremely obvious and annoying. Fang seemed woefully small, and I thought these two issues were going to drive the majority of my complaints. Turns out, I was wrong. With some basic futzing and a little product, I was able to get a look with the hair around the face that works for me. I still wish I could create some bangs or curls on the forehead, but it ended up being a much more minor nit than I initially thought. And then there's Fang, who looked like a chihuahua next to Hagrid. Once I reviewed enough screen caps, I realized that while he is a little small (or Hagrid a little big), it's not as atrocious as I first thought. My warped memory of the pooch, along with Star Ace's misleading photos, had me convinced Fang had to be twice the size he is. It turns out my single biggest issue, the one nit that bothers me the most, is that tiny nose. Had they nailed that nose, he would have easily pulled another half star from me overall. He might have a bit of a chubby Jesus thing going on, but that's a whole lot better than a cheeto Jesus. Still, he's a solid piece of work, in more ways than one. Considering how critical he is to the films, and considering how unlikely it was that we'd ever find a company willing to take on the risk and cost associated with creating the unique body, I'd say we're lucky to have him. - has a great price on the deluxe, coming in at just $350. - also has the regular for $338 and the deluxe for $388. - Sideshow has the regular version for $338, and the deluxe (with Fang) for $388. Other Star Ace Harry Potter reviews include Snape, Tri-Wizard Harry, the young Hermione, young Harry and Ron, Voldemort, Sirius Black, Mad Eye Moody, Sirius in his Prison Garb, and Ron and Harry in their 'casual' clothes.